Dear visitors, please note, that the concert of the Royal Concertgebouworchestra Amsterdam under the batton of Semyon Bychkov on Saturday, November 19, starts unusualy at 6 p.m.
For more than half a century the Bratislava Music Festival has represented the most significant feast of music taking place in our capital. The year 2016 has been proclaimed the Year of Slovak Music by the Ministry of Culture of the Slovak Republic, what opened the way for joining the feast of music with the idea of a closer contemplation of the achievements of both the domestic music creation and performing mastership. The festival begins shortly after the festivals Epoché 2016 and New Slovak Music 2016 are finished. The dramaturgy of this year’s BMF partly complements these two events and opens space for the values which did not get into their programme. The traditional character of the BMF blends with the accentuation of such values which often have not found (or only with difficulties) their way to our stages. Let us mention in this relation the symphonic work by Bratislava native Ernő Dohnányi, fully unknown albeit superior Evangelical church music by Ján Levoslav Bella, rarely played but paramount symphonic creation by Alexander Moyzes. Similarly the vocal music by Štefan Németh Šamorínsky, Ján Móry, and Ladislav Stanček is fully unknown, likewise the opera-melodrama by Marek Piaček, and chamber music of composers of all generations. The traditional focus of the festival is guaranteed through presentation of time-tested titles delivered by both Slovak and European musicians. I wish for all music lovers to find in our offer just what they are looking for. 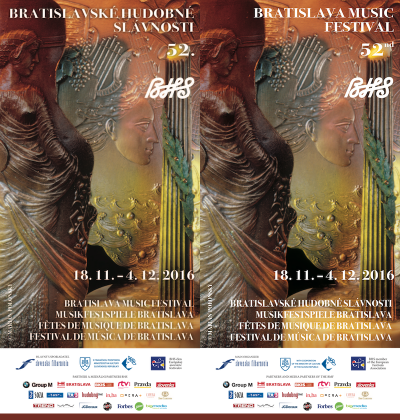 The programme of the 52nd Bratislava Music Festival presents an unusually rich offer of Slovak compositions, orchestras and performers. By this the BMF is reflecting the Year of Slovak Music proclaimed by the Ministry of Culture aiming for the popularization of the Slovak music at home as well as abroad. In one of his lectures Carl Gustav Jung wrote that art is based on continuity, not on progress torn away from its roots. 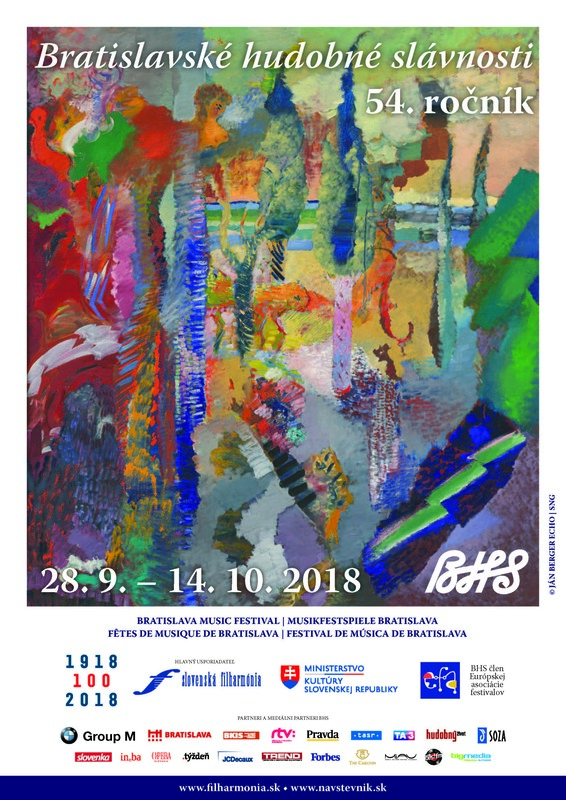 This year the BMF visitors can take pleasure not only in listening to works of Slovak masters like Ján Levoslav Bella and Alexander Moyzes, who celebrate their jubilees this year. 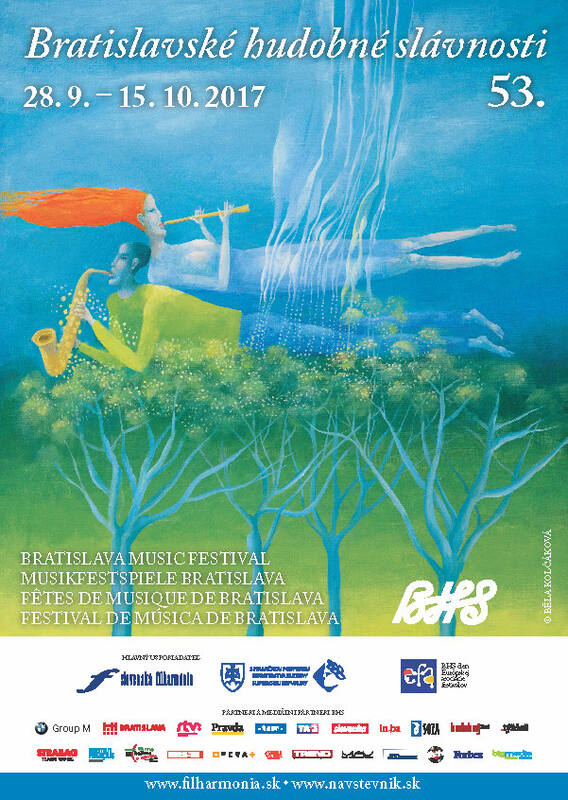 The continuity of Slovak music will also be represented in the BMF 2016 programme by music which was played on the territory of Slovakia as early as in the 17th century, in addition to several concert events focusing on the works written by our contemporaries, Slovak composers such as Ilja Zeljenka, Miro Bázlik, Ivan Parík, Vladimír Godár, Ján Zach, Jana Kmiťová, Marek Piaček and Petra Bachratá. The artistic golden thread of Slovak composers, conductors and performers runs through the whole programme plan of the 52nd year of the BMF. Two foreign orchestras will perform with Slovak conductors – Prague Symphony Orchestra will be conducted by the renowned artist Ondrej Lenárd, and Philharmonia Orchestra London will be led by Juraj Valčuha. Moreover, attractive foreign conductors and soloists will perform with Slovak orchestras – the opening concert of the Slovak Philharmonic with the conductor James Judd and violinist Vadim Repin will definitely be a special event, as well as the closing concert of the festival under the baton of James Conlon. Personally I am looking forward to the concert of the Royal Concertgebouw Orchestra Amsterdam and their supranational project Side by Side, in which the members of the guest ensemble will be joined by young Slovak musicians participating in the performance of the overture. In more than half a century the Bratislava Music Festival has become a jewel among the European music festivals. Every year its rich programme features both Slovak and foreign music, thus representing an important component of the development of Slovak music tradition. I believe that this 52nd year will fulfill the expectations not only of the listeners, but also of the organizers of this exceptional festival.